Get your retro wrestle on! I’m an unabashed fan of pro wrestling — and pro wrestling games, too. As much as I can enjoy the highly polished WWE 2K19, however, my heart belongs to the 2D grapplers of days past. 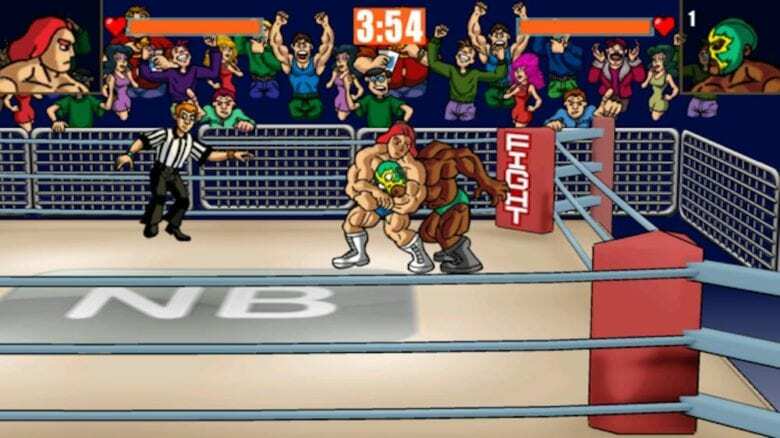 If you also have fond memories of pumping quarter after quarter into the WWF WrestleFest cabinet at your local arcade, a new iOS game is sure to have you tearing off your America-loving t-shirt in elation. Check out the trailer for Slam Mania below. Boasting controls “lovingly adapted” to the touch interface of your iPhone or iPad, Easy 8 Software’s Slam Mania promises to take you back to the past. No, it doesn’t feature the Ric Flairs, King Kong Bundys, “Macho Man” Randy Savages, “Rowdy” Roddy Pipers or Hulk Hogans who defined the 1980s. However, its created roster of retro-styled stars serves as a fun substitute. Get ready to meet the likes of Jobber Joe, Chen Lee, Mad Moose, El Diablo, Kid Turbo, and Beardo. The game offers player vs, computer action as you try and capture and then defend a championship belt. Alternatively you play against a friend in “hotseat mode.” I haven’t yet had the chance to properly dive in, but the gameplay certainly favors the kind of Slam Mania action I referenced earlier. That means big, cartoony power slams and top rope moves for a flashy “pick-up-and-play” experience. You won’t get the kind of deep wrestling simulation you’ll find in something like Fire Pro Wrestling World. However, that’s also not necessarily what you’ll want from a wrestling game you can play on your commute to work. Slam Mania is available to download from the App Store now. It’s free to play, although in-app purchases are available.